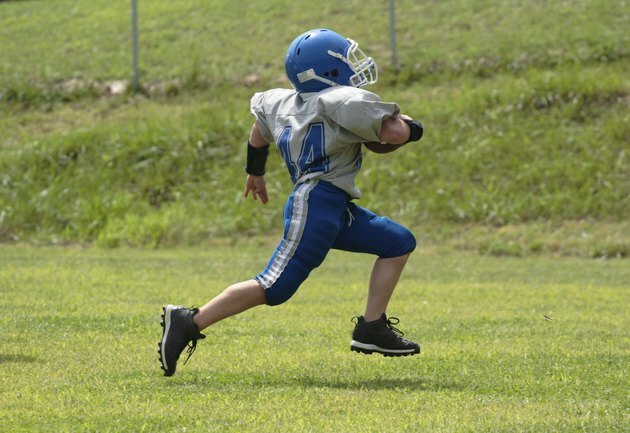 Youth football workouts must incorporate several elements. A program for young players must make the most out of limited practice and conditioning time while emphasizing safety. The workout should focus on strength development, cardio conditioning and agility training and should also include dedicated time for practicing position-specific drills and implementing game plans. The shuttle run acquaints youth players with the start-and-stop explosiveness necessary in typical football plays. Players line up along one goal line, run full speed to the 10-yard line, stop, turn and then run back full speed to the initial goal line. They repeat the exercise, but this time they run to the 20-yard line and back. For the next shuttle run, they will go to the 30-yard line and back. The specific distances should be set according to age group – players in the youngest divisions should run shorter distances. Use cones or markers to delineate the shuttle stations for your players. Basic body weight exercises are extremely effective for developing functional strength and power in youth players at all age divisions. The exercises require little to no equipment. Pushups, pullups, situps and planks are all effective. Football-focused exercises like burpees, which provide foundational strength in both the upper and lower body, are ideal for youth players ages 10 or older. Basic agility drills will develop crucial motor skills necessary to compete in football. Effective activities include ladder drills and zig zags. Ladder drills are simple. Place two agility ladders on the ground side-by-side, have the players line up at one end and then run through them, making sure each foot-fall lands within the boxes created by the ladders. For zig zags, place a series of cones separated by up to a yard of space and have players run through the cones in a back-and-forth pattern. Football training for young players presents unique challenges, but the processes that support their safety will help reduce injury. During practice, teach the fundamentals for all drills and cap the duration of practices to a length appropriate for the age group. Be on the lookout for any and all signs of injury, however minor, as well as extraordinary fatigue or any level of dehydration.